Authorities have released emergency tapes of callers pleading for police help as shots rang out during last year's school shooting in Connecticut. 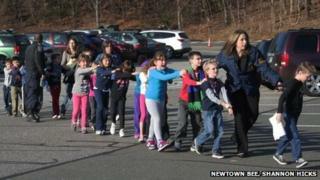 The recordings contain nearly half an hour of 911 calls made from inside Sandy Hook Elementary School in Newtown during the attack on 14 December 2012. "There's still shooting going on, please!" says school caretaker Rick Thorne. "Still, it's still going on!" A 20-year-old gunman killed 20 children and six adults at the primary school. The calls to Newtown police that morning ranged in tone from remarkably calm to panicked. The call from the janitor, Mr Thorne, lasts for several minutes, during which time six or seven shots can be heard in the background. An emergency dispatcher can be heard telling someone off the line to "get everyone you can going down there". One woman told the emergency call taker that she had seen a gunman shooting inside the building. "I caught a glimpse of somebody," she says. "They're running down the hallway. Oh, they're still running and still shooting. Sandy Hook school, please." In a separate call, a teacher says she has heard shooting and has students in the classroom - the dispatcher tells her to "keep calm and keep everybody away from the windows". On another, a man and a woman who has been shot in the foot are on the line. Dispatchers told the woman to continue applying pressure to the wound and to make sure the door was locked. The man calmly asks the dispatcher how close police are from the school. At least two of the calls came from people outside of the school who had been alerted through a text message or other method that a shooting was underway. The BBC News website has decided not to publish the audio recordings. On Tuesday, Newtown school superintendent John Reed contacted parents to alert them to the impending distribution of the recordings, warning them the tapes could act as an "emotional trigger". The recordings were made public just days after a state judge ordered them unsealed, following legal action by news organisations. State's Attorney Stephen Sedensky, the prosecutor overseeing the shooting investigation, and town officials had argued the tapes' release could hamper the inquiry and violate victims' rights. But Mr Sedensky said he would not pursue the effort further following the court ruling. The first call to emergency services came at 09:35 and the last shot, believed to be gunman Adam Lanza killing himself with a handgun, came at 09:40. Most of the deceased were killed in two classrooms. In an investigative report released last week, police determined that Lanza acted alone. They have not determined a motive for the massacre, which began with Lanza killing his own mother, but described him as severely disturbed. "He had a familiarity with and access to firearms and ammunition and an obsession with mass murders, in particular the April 1999 shootings at Columbine High School in Colorado," the report stated. While no legislation was passed at a national level, some states - including Connecticut and Colorado - imposed tougher gun laws; other states loosened such restrictions.